ISLAMABAD: Minister for Planning, Development and Interior Ahsan Iqbal has said the Chinese currency RMB would be used for transactions under the China Pakistan Economic Corridor. Pakistan and China agreed on saying goodbye to the US dollar for bilateral trade, loans and repayments as well as profit repatriation and now both the countries would use the Chinese currency RMB under a Long Term Plan (LTP) for 2017-2030. 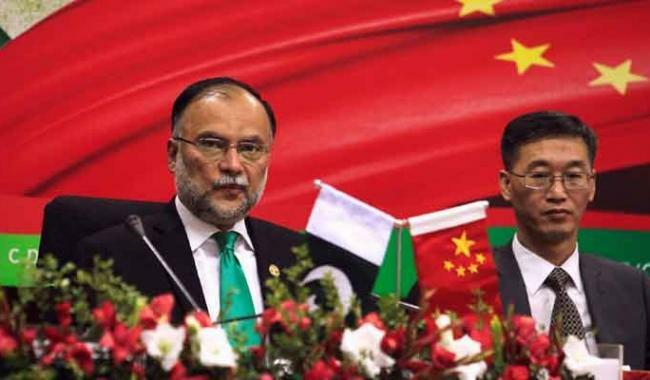 “Experts of both sides will explore the possibility of using the Chinese currency (RMB) for undertaking bilateral trade as it will help Pakistan in reducing its dependence on the US dollar,” Ahsan Iqbal told reporters after launching the Long Term Plan for CPEC here at the P Block Auditorium on Monday. The Chinese Ambassador to Pakistan, Yao Jing, was also present on the occasion. However, the minister said Pakistan’s rupee would be used in Gwadar and other areas where CPEC projects are underway. Pakistan has rejected the Chinese demand for using its RMB currency in Gwadar, which took quite long for signing the agreement on LTP. On the use of Chinese currency, the LTP for 2017-2030 states, “Both the countries shall strengthen financial cooperation between their Free Trade Zones and explore the formation of a RMB backflow mechanism”. The LTP also dwelt upon major challenges for CPEC, including geopolitical and security risks, restraint of natural and geographical factors and restraints to economic growth prospects being faced by Pakistan that possessed the possibility of choking Islamabad’s ability to sustain its growth path. Chinese Ambassador Yao Jing said CPEC is a common agenda of development, which would be expanded to neighbouring countries and regions in future. He said Pakistan is a unique and traditional friend and through persuasion of One Belt One Road (OBOR) by China, would help regional countries to achieve progress in a coherent manner. He said there is a beginning of a new era of development under which new concepts would be deployed for ensuring green development. The Long Term Plan, he said, demonstrated commitment from the government and people of both sides for undertaking development in seven envisaged areas. “This is another aspect that we want to share combined development with other countries and regions,” he added. He said a new type of state-to-state relations based on mutual respect and beneficial for all would be established. He assured that the Chinese government would deploy its 100 percent for successful completion of CPEC projects. Ahsan Iqbal said that CPEC is not a conspiracy against anyone, so no one should feel apprehensive. He said the US and the USSR had walked away after the Cold War by leaving Pakistan but now the Chinese have preferred to invest here when the country was declared an unwanted destiny by many other countries. He said there is no lull in CPEC’s progress and initiation of more projects would be done after completion of codal procedural requirements. He said the Mainline (ML-1) from Karachi to Peshawar would be expanded to the Torkham border close to Afghanistan. He said the world has changed as politics has been turned into a backburner and economic strength and prosperity became real strength of countries. He said the per capita income in Pakistan stood at $300 and it was $200 in 1980 but has now grown to $8,000 in China for one billion people, but Pakistan’s per capita stood at over $1,600. “We will have to follow the path of Chinese model for making progress,” he added. China, he said, used to import $1 trillion worth goods and services and Pakistan would have to get its due share. China had signed $46 billion projects under CPEC when many are predicting economic meltdown of the country in 2013, he added. He warned that Pakistan would have to create two million jobs for achieving 6 to 8 percent GDP growth.